One of my staple pieces in the wardrobe all year long are shirts. I am inspired by men’s wear, so when I say shirt they are really work shirts with no ruffles or fancy collars.I have so many shirts in different colours and materials. However, I try to have at least one blue shirt with stripes in my closet at all times. It is just easy to mix and match, really takes the stress away In the morning. You can dress it up to wear with a pencil skirt to make you look polished on a work day. Or dress it down with jeans and runners like you are ready to hustle. One tip for wearing shirts comfortably is to go up 2 sizes, so the shoulder line falls naturally below your shoulders; and when you tuck in your shirt, your waist looks smaller because the shirt is a little puffy. However, this only applies to thin cotton materials. 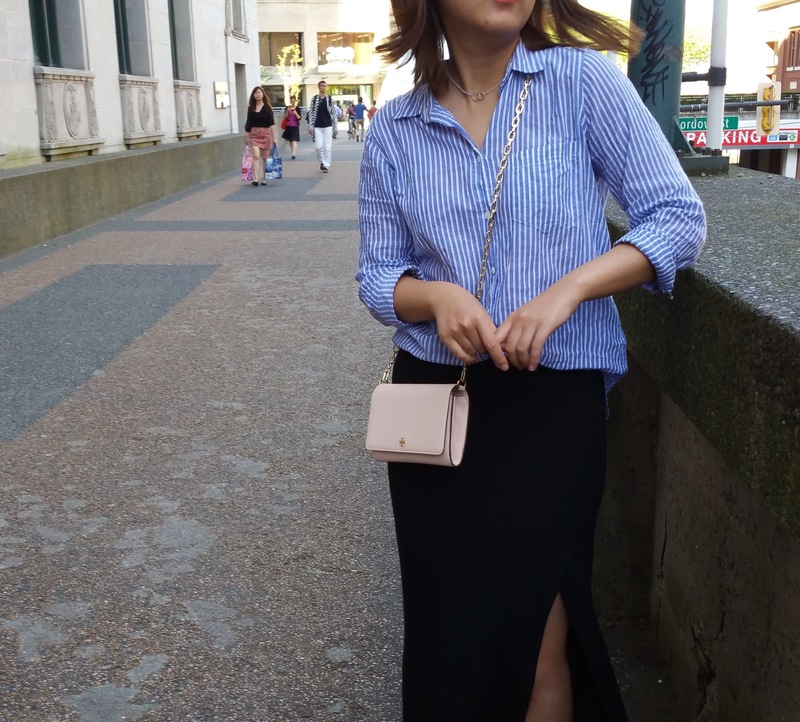 Here I am sharing with you this look, over-sized shirt paired with a feminine twist. Hope you like it. Ps. Sorry about the empty post this morning, it was published while I was editing. I haven’t had much time recently, as my course has started. So I try to get up early and write blog posts on Sundays. I apologize if my posting time has been inconsistent. 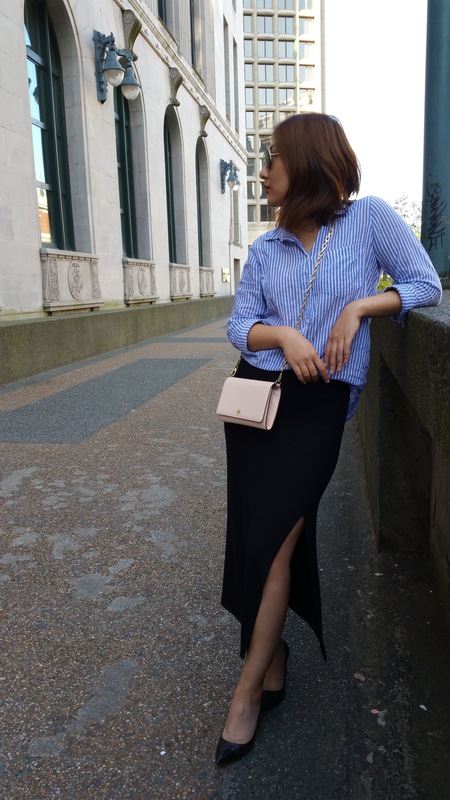 This entry was posted in blogger, fashion, fashion blogger, Midi Skirt, ootd, outfit of the day, Shirt, Vancouver, Vancouver Blogger, Vancouver Fashion, Work outfit on April 24, 2016 by Nancy.